Buying megalodon teeth can be confusing. There are so many grades, shapes, colors, and sizes. What is important? Am I getting a good deal? These and other questions may be going through your head when buying a meg tooth. For me the most important factor is “why are you buying this tooth?” The reasons are as varied as the choices in teeth. The perfect tooth for your needs may be quite different than those of another. If you are buying a tooth as a gift it may be a little more difficult than buying for your own collection. The considerations are the same. An example may illustrate the ends of the spectrum. 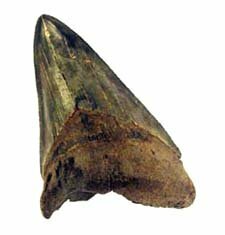 If I were buying Megalodon teeth for a 10 year old child who loves fossils and has a modest fossil collection and does not have any megalodon teeth in it I would try to get the biggest tooth that fit within my budget. A 5 inch tooth that was 50% complete can be purchased for between $15 and $30. This would make a good starter tooth. In a slightly higher price range a 3 to 4 inch tooth that had some damage but was 90% intact would run between $30 to $90. A tooth from either category would delight a ten year old. If you gave the same tooth to someone with an already impressive collection of Megalodon teeth they would not be so thrilled. If you are buying megalodon teeth for yourself all of the above is moot. You already know what you want. Read on for a few tips on getting the best tooth for your money. Megalodon teeth are very much like a super-sized version of the Great White Shark teeth. There are some differences. The most notable of these is the darker chevron shaped area between the root and the blade of the tooth. This area is called the bourlette. Other differences are the serrations at the edge of the tooth. These are finer than in the white shark and more regular. Megalodon teeth are highly prized by fossil collectors, especially large teeth in excellent condition. Two to five inch teeth are fairly common. Teeth over five inches are sought after by collectors because of their rarity. Teeth of this size in excellent condition sell for one to many thousands of dollars. Seven inch megalodon teeth have been found but these are extremely rare. Fossilized megalodon teeth can be almost any color since they take on the color of the sediments in which they are deposited. Most commercially available teeth are dark gray, black, or brown in color. This is because they come from similar areas; tidal rivers of the south east United States. These rivers tend to be rich in phosphates that color the fossils. Other colors are more rare and therefore usually command a higher price. What part of the shark’s mouth a tooth comes from determines its shape, size, and of course price. The classic large triangular teeth come from the front of the mouth. These are more popular with collectors and command a higher price. The megalodon teeth from the rear of the mouth tend to be short and wide and sometimes offset to one side. Are the edges and point of the tooth sharp? Are the serrations complete and well defined? Is the Bourlette visible and complete? Is there unique coloring? (gray, brown, and black are common) Other colors are usually at a premium. Adding megalodon teeth to your collection will take some commitment on your part. They are not cheap. It is possible to pick up a small (3 inch) tooth with significant damage for $20 to $50. A really nice one of this size can run $200 to $250. Teeth in the 4 inch range run from $30 to $100 with damage and $150 to $400 for high quality specimens. The price for 5 inch teeth jumps significantly. Damaged teeth of this size are $60 to $250. High quality teeth of this size run between $250 and $500 or more. For large teeth (6 inch) expect to pay over $300 if they are beat up looking and $800 to many thousands and more for a high quality 6 inch tooth. The demand for large high quality megalodon teeth far exceeds the supply. As a result the price of these rare teeth has been steadily increasing year after year making these fossils good investments that will gain value over time. Note: This article was written in 2006. While the information is still generally true the prices have gone up considerably.